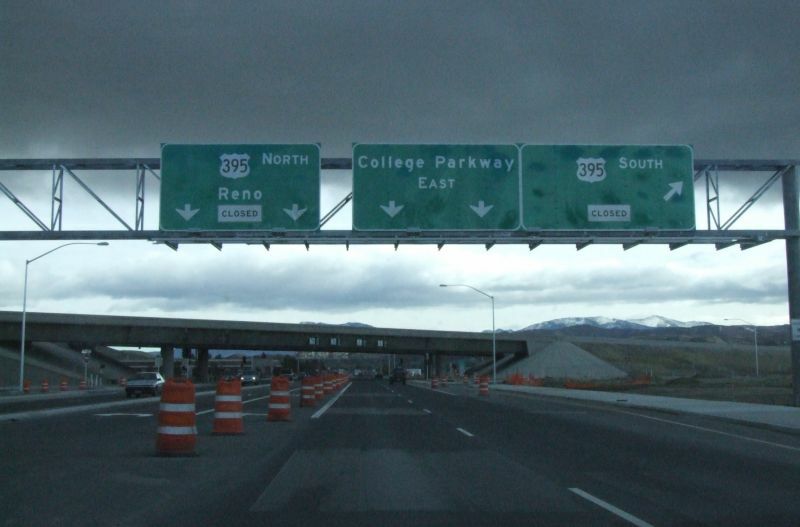 An opening date has finally been set for Phase One of the Carson City freeway. The stretch of road, which runs about four miles from Hwy 50 East to the north end of town, will open to traffic on February 16th. There will be a ribbon-cutting ceremony in the morning, and the first cars will roll up the on ramps later in the afternoon. This opening is at least two months ahead of schedule, as the original plan had the freeway opening in April. But, the whole project is decades late anyway, so it all balances out. The Saturday before the opening, on Feburary 11th, the freeway will be open to foot and non-motorized traffic for a few hours. You can walk the entire length of the roadbed, looking down on the city and feeling like you’re on top of the world. This is your last chance to get up there and walk or ride your bike along the freeway without fear of getting run down by a semi, so you might want to take advantage of it! This new half-freeway will be a great help to people who live out in the east part of the valley, and cut down on their commute times to Reno by a large margin. But won’t make much a of dent in the lives of those of us to the south. That won’t happen until the entire freeway is completed, meeting up with Hwy 50 South at Clear Creek in 2010. Only then will the rest of us get to bypass Carson Street and take the express route into Reno. Construction starts this summer on that phase of the freeway, and is going to stretch for the next four years. And where the northern half of the freeway is above ground, the southern phase will be down in a trench as it passes by Fairview and Edmonds Streets. So the next time NDOT has one of these “Fun Runs”, you’re not going to be so much on top of the world as down in a ditch.